This weekend I had the fortunate opportunity to go to Fairfax, Virginia, to attend a seminar hosted by the Shalem Institute, an organization that fosters contemplative living and leadership. Their invited guest to present for their annual Gerald May Seminar was Bernard McGinn, who is Professor Emeritus of Historical Theology and of the History of Christianity in the Divinity School at the University of Chicago. 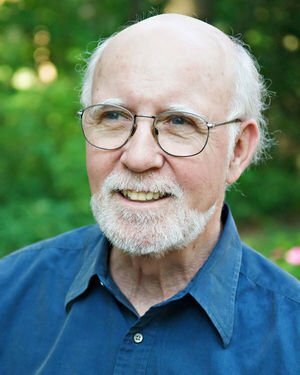 McGinn is an American Roman Catholic Theologian and is considered one of the world’s foremost expert scholars on the history of Christian mysticism. He has written seven volumes outlining the history of Christian mysticism, and may write two more, bringing the history up to the present time. This series is known as The Presence of God. It was wonderful to be able to hear from a modern scholar on this subject, one who has studied it for many decades in an academic environment as a historian. He has an extensive and thorough knowledge of all the Christian mystics, their works, the way they have expressed themselves, the many different modes, facets, features, ways, languages, practices, and nature of Christian mysticism. It was good to hear his thoughts on so many things. 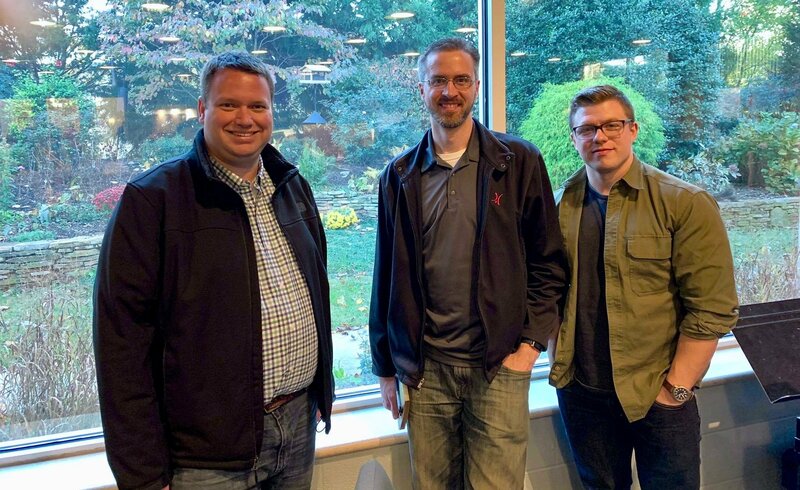 I also had the privilege of meeting face-to-face a couple new friends I have met online a few months ago, Michael Potter and Jory Pryor, who also share an interest in mysticism, and deconstructing and reconstructing faith. It was great to finally put a face to a name, to be able to talk freely with our voices, to share our feelings with each other, to sit with one another and feel each others’ presence. I am happy to know them and consider them my friends. Meeting up with new friends at the seminar. From left to right: Michael Potter, me (Bryce Haymond), and Jory Pryor. McGinn’s lecture on Friday night was on the subject of “The Compassion of the Mystics.” He shared how the mystics have viewed compassion generally since the first few centuries of Christianity, and focused on some examples from the lives of the mystics Francis of Assisi, Ida of Nivelles, and Francis de Sales. Probably the main thing that I took from this lecture was that the word compassion was often associated with a very deep moving within the mystics, even within their bowels. It referred to by the Greek word splanxna (see here and here), which refers to one’s “inner parts,” the “nobler entrails” such as the heart, lungs, liver and kidneys, or what we might more colloquially call our “guts.” When the mystics were moved to compassion, they felt it deeply in their inner parts, their guts, particularly in their heart or center. In a very real way, their inner parts were felt intensely, acutely. This word and its various forms is therefore used when translated as “compassion,” or “tender mercies,” or “affections,” or even at times is translated more literally as “heart.” What seems clear is that the mystics feel very deeply within themselves, in their internal organs, sometimes in a very real way. On Saturday, the seminar involved more free and open discussion, workshops, dialogue, sharing. McGinn spoke about many different ideas or elements of mysticism, and took questions from participants. It was a fascinating exchange of minds. I will share some of my notes below from McGinn in these discussions, and offer my commentary in brackets. It involves paranormal religious experiences – visions, stigmata, levitation, living without eating. These sometimes are related to mysticism, but are not its essence. It is an elite phenomenon, only for a privileged few. The mystics are put up on a pedestal, and are considered unusual or extraordinary people. it is for everyone to have a deeper spiritual life. It’s not exclusive to any special people. Mysticism is important in the spiritual life, even for the Christian. The best mysticism is “everyday mysticism,” a mysticism which may be accessible to each and every person. This includes a deeper sense of God’s transforming presence within, and it works together with institutional and intellectual elements in religion. Thomas Merton, New Seeds of Contemplation. McGinn thinks this is the best of Merton’s books. In it Merton says that mysticism is an awakening to life, an enlightenment, and is holistic to the life of the person. Mysticism is not solipsistic, or only concerned about me, myself, and I. It finds God in community with others. It may have periods of solitude and individual privacy, but then it becomes part of the community again. Anthony of the Desert is an example of this. It’s a separation and the a reintegration, a going out and then coming back in. Mysticism is for everybody, everywhere, and serves an important function in our lives. Thomas Aquinas once said that not everyone in active life will come to contemplation, but every Christian must participate in contemplation. “Mysticism” is a modern word. 17-18th century. It becomes an academic term in 19-20th century. “Mystical” is a very ancient word, from 2nd century. Comes from the Greek mystikos, meaning secret, hidden, not immediately evidence. “close the mouth.” It has inner meanings, inner depths only evident to believers. There is a mystical sense of scripture. There are surface meanings which can easily be understood, but there are deeper mystical or spiritual senses, deeper meanings. In the Christian rituals, sacraments, such as baptism, Eucharist. There are mystical depths in these, deeper meanings. Mystical “contemplation,” or theoria, is directed towards God, an attentive gaze, towards God. Mystical “union” was beginning to be talked about by the 4th century, deep union with God that can’t be revealed to anyone else except the person to which it happens. Pseudo-Dionysius, The Mystical Theology, 5th century. This mystical doctrine is known by living in Christian community, a whole way of Christian living. Mystery was from musterion. The Mystery of the Kingdom. It was hidden. Contemplation, or theoria, was a gazing, or paying close attention to. “Blessed are the pure in heart, for they shall see God.” This “seeing” was not with eyes, but with the mind. They are contemplating God. Matthew 5:8. Deification – to become God. theosis. 2 Peter 1, “participants in the divine nature.” The whole purpose of the incarnation was deification. God became man, so that man may become God. “not by nature, but participation.” Almost every major Christian mystic of the west has talked about deification. In William Ralph Inge’s 1899 book Christian Mysticism, he gave 45 definitions of mysticism. Conversation about it is part of understanding the term. It’s a process. It’s not just about a mystical union experience, but a life lived. What was the preparation for the experience? What was the context of the experience? What was the effects of the experience in the life of the person? Teresa of Avila, for example, started a Carmelite order so that others could have longer contemplative prayer opportunities so they could also have these types of experiences as she had. It is more than an experience, but a consciousness. Not just a feeling. It was the whole consciousness, the whole person. An awareness on every level! Radically holistic. Changes to thinking, loving, acting. A special consciousness of God. Thomas Merton called it a “meta-consciousness.” God is present as a co-presence, co-awareness. A subject, object, and God presence. There is a positive aspect, called the cataphatic. It’s not an intellectual knowing of God, but a connatural knowledge of God. We know God as inborn. There is a negative aspect, called the apophatic. The mystic comes to realize that you can never really intellectually know God. Ever. It is immediate, a becoming aware of God on a new and different level. It is transformative. It changes you, deeply. The way you think, love, attitude towards others. It is a Presence. Consciousness of the Presence of God. It is spoken of as a union, vision, tasting, touching, radical obedience, a stretching out after God. Saint Augustine talked about a “vision of Divine Light,” an ascending to God, a touching of God, but he never says a union with God. John May – The Way of Unknowing. There is an infinite sense of presence, and a finite sense of absence. Sometimes it seems more present in the absence. Michael Sells – Mystical Languages of Unsaying. There are modalities of language. Mysticism goes beyond language. Meister Eckhart – God is with you in everything that you do. Find God in a stable as well in a church. The mystics’ experience cannot be communicated. God and what they have learned from God. So how do they speak of the unspeakable? Say a lot. But they always qualify it by saying they can’t really say what it’s like, but I feel compelled to speak about it so others can open themselves to it as well. The mystics’ language is special. God is not an object. Meister Eckhart – this and that are typical of perception. God is outside of this and that. He is one with everything. When we say things about God we’re unsaying them. Language subverts itself, it goes beyond itself. It’s not scientific, but poetic. John of the Cross was quite poetic, and added commentary prose about his poetry. apophatic – negations or denials. All mystics use both ways. Apophatic is more appropriate, since God is beyond everything that we know. Negations are higher than the affirmations. Points to Mystery. God is beyond both affirmations and negations, which are both finite thinking. This kind of language then becomes what McGinn calls hyperphatic, or going beyond all speaking, thinking, to silence. Spreading the message of mysticism is through reading, and there is a lot of material now available. The mystical literature is now available. Classics of Western Spirituality series. There is a deep hunger for the spiritual/mystical traditions today. Many mystics are prophets, and many prophets are mystics, but they are not exactly the same thing. I hope these notes have been helpful. I look forward to reading more of Bernard McGinn’s works, particularly his series The Presence of God, which sounds like a very comprehensive study of the Christian mystics. Of course, nothing can replace the mystical experience itself, as McGinn himself notes. Pingback: “Canticle of the Sun,” by St. Francis of Assisi, and Joseph Smith’s “Olive Leaf” – Thy Mind, O Human!